Robert Alonzo Welch. Courtesy of UTHealth. Image available on the Internet and included in accordance with Title 17 U.S.C. Section 107. Goose Creek Oilfield, circa 1920s. Courtesy of the Bullock Texas State History Museum. Image available on the Internet and included in accordance with Title 17 U.S.C. Section 107. WELCH, ROBERT ALONZO (1872–1952). Robert Alonzo Welch, oil producer, son of Alexander Chambers and Mary (Gary) Welch, was born on February 15, 1872, near Newberry, South Carolina. At the age of fourteen he borrowed fifty dollars and on August 5, 1886, boarded a train for Texas, where he was met in Houston by his cousin, Chris Welch, founder of the Welch Academy, a Houston school for boys. During his first few years in Houston Robert Welch worked for several different firms. In 1891 he went to work as bookkeeper, later doubling as salesman, for the Bute Company, a paint firm that also sold insecticides. There he remained until July 1, 1927, at which time he resigned as secretary-treasurer but stayed on as a member of the firm's board of directors. Welch became interested in oil when the Spindletop oilfield came in near Beaumont in 1901, and he was soon nicknamed "Pete" by his friends because of his intense interest in petroleum. He bought an acre in the middle of the Spindletop field and sold it for a $15,000 profit, a sale he was soon to regret since the land brought $1 million a few weeks later. It provided him, however, with money to invest in the Goose Creek oilfield, which later brought him a handsome profit. In 1905 Welch made another important oil deal for drilling rights on the Gaillard lease twenty-five miles southeast of Houston, near Goose Creek. Drilling began in 1907. The hole was dry, but he decided to buy additional acreage in that area anyway; he founded the Ashbel Smith Land Company that same year, naming himself president. The profits from this venture were the beginning of the fortune he was to make in oil, sulphur, banking, and real estate in Houston and surrounding areas. Robert Alonzo Welch's Grave. Image available on the Internet and included in accordance with Title 17 U.S.C. Section 107. 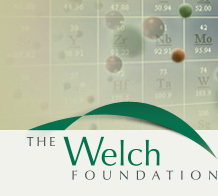 Robert A. Welch Foundation Logo. Image available on the Internet and included in accordance with Title 17 U.S.C. Section 107. Welch never married. He died in a Houston hospital on December 27, 1952, and was buried in the Glenwood Cemetery. He left an estate valued at $42 million, the bulk of which went to a trust fund for the support of chemical research in Texas "for the benefit of mankind." He had asked that the fund be called the "Houston Foundation," but this name was changed after his death to the Robert A. Welch Foundation. Because he realized that chemistry might not always play the leading role in the world that it had during his lifetime, Welch stipulated that his trustees must make the support and encouragement of chemical research their sole concern only for ten years; after that period the research area was to be left to the judgment of the trustees. By 1990 fifty-four educational institutions in the state of Texas had received funds from the Welch Foundation. Of these, seven received more than $500,000. They were: the University of Texas at Austin, Texas A&M University, Rice University, the University of Houston, Baylor College of Medicine, Southwest Medical Center in Dallas, and the University of North Texas. Because Welch died without heirs other than his sister, who was already privately wealthy, he also specified in his will that 15 percent of the net value of his estate be divided among his employees. The amount thus divided was $7,500,000. Another $500,000 was set aside for extending financial aid to employees. James Anthony Clark, A Biography of Robert Alonzo Welch (Houston: Clark, 1963). Vertical Files, Dolph Briscoe Center for American History, University of Texas at Austin. Handbook of Texas Online, James A. Clark, "WELCH, ROBERT ALONZO," accessed April 20, 2019, http://www.tshaonline.org/handbook/online/articles/fwe18.